On a Wing and a Whim: Want something to read? Raina escaped to Freeport with a tour booked under a stolen ID, and a plan to lose herself in the city. Instead, she found a city in revolt, and now both sides are after her to control the alien gifts engineered into her DNA. Her only ally is an offworld investigator trying to get to the bottom of the explosive mix of on-planet and alien politics... but his secrets are even deadlier than her own. From the back alleys of the souk to the depths of alien ruins, they're now in a desperate fight to stop the revolution before everything is lost! Aw, thanks, guys :-) Hope you enjoy! Preference note: I prefer longer chapters, perhaps with shorter subchapters within them like Wright does in his Eschaton books, or Weber in in Safehold series. The endless short chapters make things feel very rushed. I wasn't sure how to chapter this one, whether to switch between viewpoints or have back and forth in the same chapter. After kicking it around with a couple alpha readers, they concluded it was less confusing, if rushed, to do shorter chapters and clear viewpoint transition instead of "Wait, who's speaking now?" 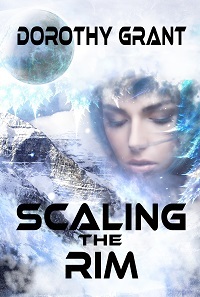 I read Scaling the Rim and Shattered Under Midnight this week. Your stories sucked me in and held me until the end. The romance was sweet and tasteful. Unlike some books I could name, I would be happy to recommend this to a friend without embarrassment! That is a welcome change. Usually I skip what’s too much for my taste in a book (I prefer discretion and imagination to description), but that makes it hard to recommend. Your pacing was nice. The story never stopped or dropped me out. To be honest, I don’t rate plot unless the story or characters exasperate me. I liked the characters and liked watching them solve their problems, so don’t ask me about plot plausibility! I am not a writer, purely a reader of light fiction, so I just try to figure out what I liked or disliked about a book and why, and your books are so much fun that I will be happy to buy future books that you write. 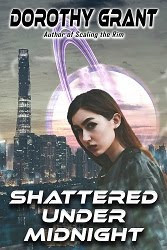 I read Shattered Under Midnight through and was so sad that it ended that I went back to the beginning and started to reread it. The second time through I started noticing typos that strangely were never there the first time! I was wondering if there is a way to report typos to you? I don’t want to be a bother. But I’ve seen some people denigrate independent books for insufficient copy-editing, and your book is great, so I would like to help if I could. I will be re-reading the book anyway, it was so much fun. AmyB - thanks, I'm glad you enjoyed them! As for the typos, I knew there had to be some left, because I hunted and hunted... but there's always a few that escape me, and my copyeditor. If you could, please email any you find to my darling man at bayourenaissanceman at gmail.com, and I promise I'll put up a new edition without 'em! I just left a review, it is a fun read and quite a wild ride with a lot of new information to process. Did you add the part about redheads to tweak Lawdog??? I especially applaud the complete lack of Weberian infodumps, well done! It made me think - because the received wisdom in most scifi is "if genetically experiment on people, you'd go for guys, so you could get the Y chromosome expression every time." Then again, most scifi is thinking super-soldiers. I thought on how that only works on stuff that's specifically Y-chromosome, and boys are generally harder to control than girls, so when you're going for the first experimental iterations and proof of concept, you may want girls instead. And if you're going to aim for genetic expression on women, then you want to make sure they don't have dominant chromosomes hiding the traits you're seeking, so... redheads.